Take 1 tablet 1-2 times a day after a meal. We recommend taking the capsules with a glass of water before meals. This is due to the fact that fat contained in food in a large amount may hinder the body's absorption of magnesium lactate, and thus reduce its bioavailability and the speed of its distribution in the body. In addition, the vitamins with which the supplement is enriched are water-soluble, so taking the capsule with a glass of liquid speeds up their action. However, it is worth bearing in mind that it cannot be coffee or strong tea, because the substances contained in them limit the absorption of vitamins from group B. A dietary supplement that promotes healthy sleep and helps control appetite. 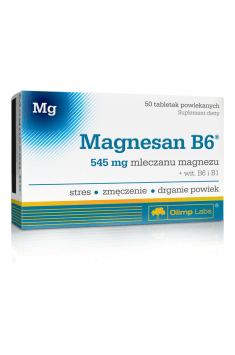 Magnesium with vitamin B6. Supports heart, strengthens bones, prevents cramps and improves mood. 880 mg of optimally extracted krill oil per portion. Complex formula supplementing the diet in healthy fats. Quercetin delivers valuable free-radical protection for blood vessels and other vital tissues throughout the body. Collagen with vitamin C, manganese and copper. It protects the articular cartilage, muscles and tendons.